You can view the logs of operations performed on SLB instances, HTTP listeners and server certificates in one month. The operation logs are recorded in ActionTrail. 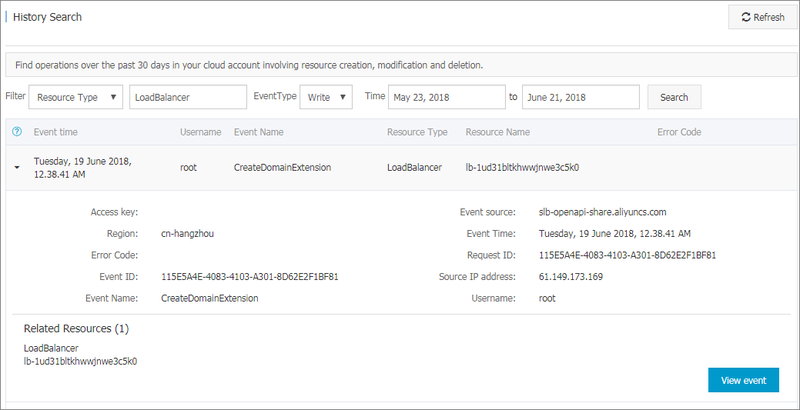 ActionTrail records the operations acting upon your Alibaba Cloud resources, you can use these records to analyze your account security, track changes made to your resources, and achieve compliance. In the left-side navigation pane, click Logs > Operation Log. Select Resource Type as a filter. Select the SLB resource of which operation logs you want to view. In this task, LoadBalancer is selected. In this task, All is selected. Select the time range to search. Click Search to view logs of operations performed on the selected resource. Expand the resource to view more detailed information.